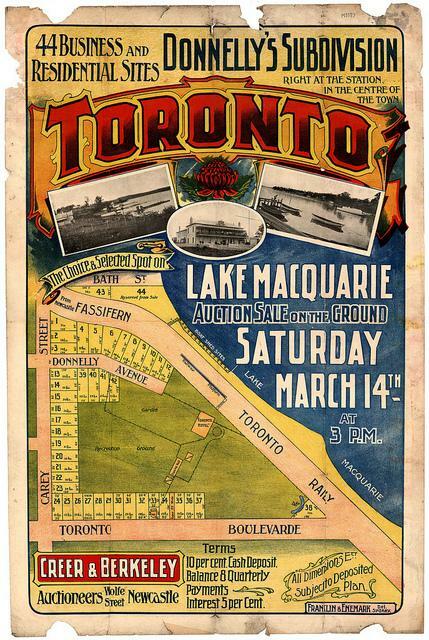 Donnelly’s Subdivision, Toronto, Saturday March 14th. From the Northumberland and Permanent Building Investment and Loan Society Archives, University of Newcastle, Cultural Collections. The Toronto Hotel was built on the site of Reverend Lancelot Threlkeld’s second mission house. Threlkeld was Toronto’s first landholder, taking up the grant in 1831. Threlkeld operated the Ebenezer Coal Mine at Coal Point. The property passed through several hands before the Excelsior Land Investment and Banking Company purchased the estate in 1855. At this time the rail link between Sydney and Newcastle was under construction. The company planned to build a tourist resort and built the Toronto Hotel. It was a popular fishing, sailing and picnic ground for the Lower Hunter. In 1887 the company sub-divided the land into Toronto as a residential estate. The first public school opened in 1890 with twenty pupils. Toronto was named after the city in Canada, to honor a visiting Canadian Olympian. 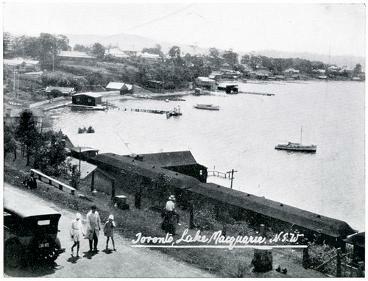 Postcard of Toronto, Lake Macquarie, . From the University of Newcastle, Cultural Collections.